If you are searching for “how to cool a garage“, “how to cool a garage with no windows“, or “ac unit for garage with no windows“, this post and our products/services can help! There are many effective ways to cool a garage, but the professional 4 products/services listed above are by far the most effective methods of cooling any type of garage, even one’s that do have windows. 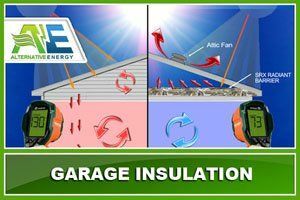 Garage attic insulation, also known as, Garage radiant barrier, is needed to stop the heat from entering your garage. Installing garage radiant barrier will cost you about $500 for 1 car garage and about $800 for a 2 car garage. In general, it costs around $2 per sq ft to install garage radiant barrier. We use SRX garage radiant barrier to block out 98% of radiant heat. You can buy a similar type of radiant barrier material but no radiant barrier will stand up to our patented SRX garage insulation. The great thing about SRX is that it works for your home and is the best insulation for hot climates. SRX comes with a lifetime guarantee to save you 50% on heating and cooling electricity costs. Learn more more about garage insulation costs below. Here are our garage attic insulation costs. These costs include the garage attic insulation foil and our labor fees for installation. We ship nationwide for customers who do not live within our service area, please call for pricing. SRX radiant barrier was originally invented to keep your home’s attic cool. It has the capability of saving you 50% on your overall heating and cooling electricity costs guaranteed! The great thing about our new reflective insulation technology is that it never stops working like current radiant barrier foil does. SRX solves all problems with radiant barrier technology. 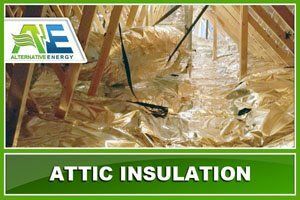 Installing attic insulation or radiant barrier in your home’s attic is the best way to reduce APS & SRP electricity costs during the summer time in Arizona, Florida & Texas. Plus our SRX reflective insulation will make all the individual rooms in your home the same temperature and makes your home A/C unit run more efficiently. SRX is also the best insulation for cold climates and can keep your home warm during the winter time too. Learn more about how radiant barrier works here. 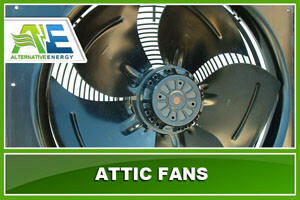 The garage attic fan will push all of the remaining heat out of the attic of your garage. We used the highest powered German attic fan money can buy. This ensures that the air is circulated frequently and keeps your garage at a much cooler temperature. It costs about $250 to get an garage attic fan professionally installed. Without an attic fan, the garage would become a thermos oven, keeping in all of the heat. No radiant barrier installation is complete without installing an attic fan or some other type of garage ventilation system. If a radiant barrier contractor tries to tell you that an attic fan isn’t need, run! Although, just installing garage attic insulation and an attic fan isn’t enough, you need insulation on the garage door to keep all of that heat out as well. Garage door insulation is by far the most important component to cooling a garage and lack of it are one main reasons why your garage gets so hot in the summer. Garage door insulation keeps your garage cooler, decreases the time needed to cool down the garage, make garage air conditioning work more efficiently and more. On avg, garage door insulation costs about $100 to install in a single car garage and around $250 for a double car garage. We use the same patented SRX radiant barrier to insulate your garage door as well. SRX is the best insulation for garage doors and fills in any tiny holes or cracks where hot air can make its way in. Although, installing garage attic insulation, a garage attic fan and garage door insulation alone won’t make your garage completely cool. You have to install some kind of garage cooling system in order to cool down the space effectively, and keep it cool. Only by installing a garage mini split ac unit will you experience true garage cooling with controllable temperatures. Combining all 4 of these products together is the best way to cool a garage in the summer. Here are our garage door insulation costs. 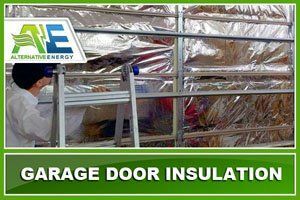 These costs include the garage door insulation foil and our labor fees for installation. We ship nationwide for customers who do not live within our service area, please call for pricing. Ductless mini split ac units are the perfect ac units for garages with no windows. They are also perfect for homeowners who not only want to keep their garage cooler, but for those who want complete control over the temperature inside the garage space. Garage mini split ac units are perfect for cooling down garages fast. Also, garage mini split systems are the perfect ac units for garages with no windows because they don’t use the window as a vent. They have their own ventilation systems where you only have to drill a small hole in the wall for installation. Remember, you can’t install window ac units because there are no windows. 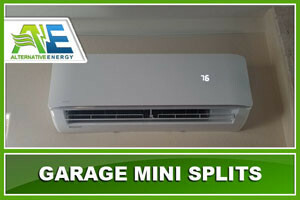 Garage mini split ac units are ductless and only need a small hole drilled to vent to connect to the outside unit. This solves the problem with no garage ventilation of garage windows. Not only can garage mini splits make your garage more pleasant during the summer but it can also help decrease your home’s central air conditioning expenses. When you cool down the closest part of your garage that is connected to the house, it also keeps rooms that are attached the garage cooler. Installing a ductless ac unit for your garage can range from $2500 for a 1 car garage, $3,000 for a 2 car garage, all the up to about $4,000 for the some of the really nicer mini split units. Here are our garage ac unit costs to install. These costs include the garage ac unit and our labor fees for installation. As you will notice below, you can get more square feet of cooling space from your mini split system when you also install SRX garage insulation and garage door insulation. We ship nationwide for customers who do not live within our service area, please call for pricing. Buying a portable air conditioning unit can help you cool a garage with no windows. However, you will have to drill some type of hole for ventilation. Portable air conditioners put out a ton of heat and are known for being less efficient on electricity. It will help keep the space cool but you will need some type of insulation if your are going to keep the cool air in. If you only looking to cool your garage a little bit or you live in a state where it doesn’t get very hot, a portable floor fan should work just fine for cooling your garage. However, if you live in a hot state like Arizona where temperatures get up to 120 degrees and higher, a simple floor fan is going to feel like an oven is blowing hot air at you. If you can work with your garage door completely shut or partially open, installing an air exchange system can effectively cool off your garage with no windows by 10°-20°. These systems mount to your garage’s ceiling and pull hot air from below and push it into the attic where it is forced through a gable, fan or vent. It costs about $300 to install an air exchange system DIY. Here are a few of the other ways to keep a garage cool with no windows but as we mentioned in above, the only way to effectively keep your garage cool without windows is by installing garage insulation and a garage mini split ac unit. These heating and cooling methods also work for heating and cooling a garage workshop. We not only offer content to help you find ways to cool your garage without windows, but we also offer garage cooling services to help you get it done! Alternative Energy, LLC is a full service energy company with years of experience in home cooling and energy efficiency upgrades. Get an affordable quote and SAVE MONEY by combining all of these services together! We know all about cooling down garages in the Phoenix, Metropolitan Area of Arizona, Miami Dade County, Fort Lauderdale & Broward County, Florida areas. 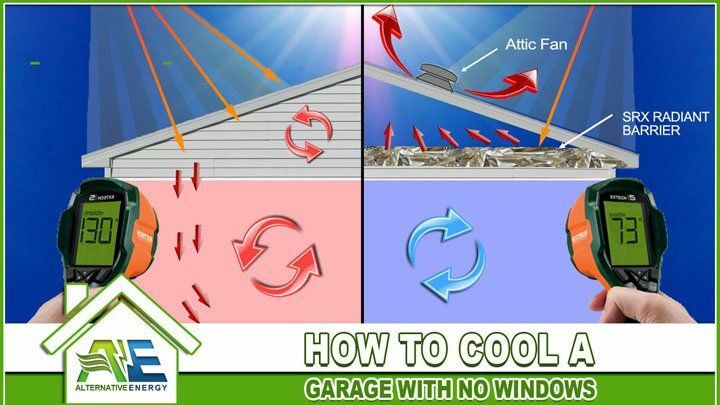 Alternative Energy, LLC can help you cool a garage with no windows with our patented energy saving products. We offer garage radiant barrier, garage insulation, garage attic fans, garage mini-splits and more. Give us a call today at (480) 744-1803 if you are interested in receiving a free garage cooling quote. We offer garage cooling estimates to the entire Phoenix Metropolitan Area including: Phoenix, Mesa, Tempe, Gilbert, Chandler, Surprise, Peoria, Glendale, Scottsdale and more. Also serving San Antonio, Texas.